Update: The giveaway is over and the randomly selected winner is: Betsy Harris! Congratulations! And thank you to everyone who entered also huge thanks to Seea for pulling this together also thanks to Bing Surfboards, Poler, Nixon and Manduka. Together with our friends at over at Seea we can present a fantastic giveaway together with Bing Surfboards, Poler Stuff, Nixon & Manduka. How about free air fare from anywhere in the world, your own glossy Bing Board, Seea Suits to bring along, a Manduka yoga mat, Nixon backpack, speaker, watch and a duffle bag & surfboard bag from Poler Stuff. 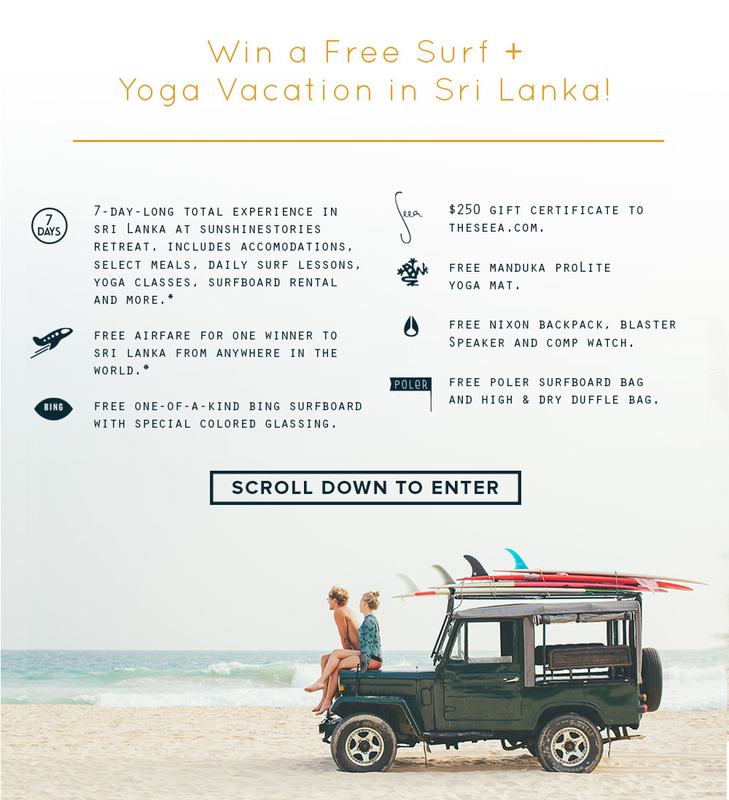 Oh and I forgot the best: one weeks surf & yoga retreat with us here in Sri Lanka. To win this mega price click here and follow the instructions. You will find all the details and how to ENTER HERE. I LOVE your website layout, it’s beautiful ! I really really want this!! Wow what a prize! Wish I could win it and bring my boyfriend! We went to Sri Lanka last summer in 2015 and traveled around the island in our own tuktuk – and we would LOVE to go back again! Myself and my Partner have always dreamed of this heaven on earth. Thanks to the people involved, we have the chance to fulfil this dream. This sounds amazing. I have just completed my yoga teacher training and would love to explore and do yoga and surf here. Please pick me ??? What I would do to win this for my best friend’s 21st. 😀 omg!! this would be a dream to win this.. I love you site, so inspiring! This would be awesome for me and my boyfriend. Yes, the winner is Betsy Harris!